France, Southwestern. With separate map inset of Paris and environs, main and sheet title, signs and symbols, list of the départements 21-35 and miles indicators. 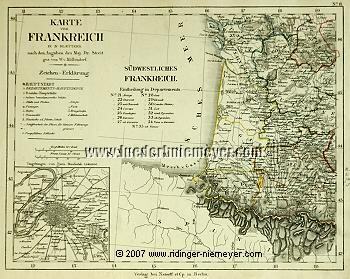 Regional map after Friedrich Wilhelm Streit (Ronneburg, Thuringia, 1772 – Berlin 1839) drawn by W. v. Möllendorf. Steel engraving colored in outline for Natorff & Cp., Berlin. (1833/37.) 8⅞ × 11 in (22.5 × 27.9 cm). From Streit’s 4-sheet set of France. – Up to La Rochelle incl. of Pertuis Breton – Montmorillon – La Souterraine/Creuse – Tulle – Cahors – Toulouse – Villefranche – Urgel . On the Spanish side still with Huesca – Tudela – Vittoria – Bilbao . The environs of Paris up to Argenteuil – Saint Denis – Bondy – Rosny – Vincennes – Nogent – Saint Maur – Bourg-la-Reine – Saint Cloud . – In the right white lateral margin note in pencil. Small tear in the wide white right margin backed acid-freely.